This professional equaliser is a great start for DMG Audio. If it's any indicator of its future output, we're all ears. There's a lot to take in. Watch your speakers with auto listen! Dave Gamble is the man behind DMG Audio - you might not know his name, but he's worked on a number of high-profile plug-in projects from respected companies such as Focusrite, Sonalksis and Brainworx. EQuality sees him striking out on his own, and a quick look at the feature list shows that he intends to hit the ground running. 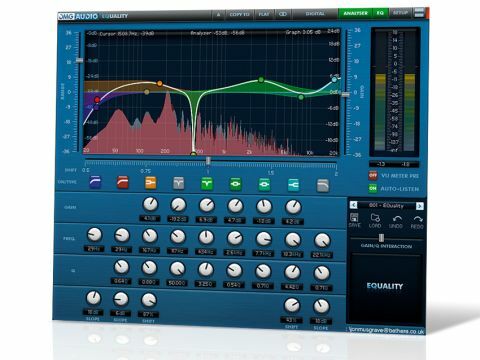 This EQ plug-in has nine bands (four bell/notch, two shelf/bell, dual high-pass and one low-pass), five EQ styles, M/S processing, a spectrum analyser, foldable interface and more. Scratch the surface and the features keep on coming. The Range slider scales the gain of all bands simultaneously, from -36dB to 36dB, with the negative settings enabling you to 'flip' your EQ curve, so boosts become cuts and vice versa. There's a global EQ frequency Shift slider too, working as a multiplier ranging from 0.5 to 2. Next up, you'll find that the shelving bands have their own Shift knob, with which you can move their points of resonance. The gain/Q interaction is fully adjustable - with higher settings, increasing gain narrows the Q, which is a feature associated with analogue EQs. Rounding things off is the 'auto listen' option, which solos the band you're modifying, to assist with fine-tuning and locating problem frequencies. Amongst the many preferences are meter ballistics and scaling options (VU, PPM, digital, BBC, full scale, Kf12, Kf14 and Kf20). As we mentioned, EQuality includes five EQ modes. For most uses, DMG suggests using Digital or Digital+, the latter having a slightly more accurate high-end response. Both are zero-latency and CPU-efficient. It's worth saying that these modes have been designed to sound 'analogue', so don't be put off by the names. The remaining three all employ impulse-response-based (FIR) techniques. The Linear Phase option gives zero phase distortion but with some processing latency. The Analogue Phase mode uses a similar technique but instead replicates the phase shifts of an analogue EQ and should sound extremely close to the Digital option. Finally, Minimum Phase shifts the energy of the impulse response to the start, so there's no delay and minimal transient smearing. The differences between modes are subtle, but they can become more pronounced if you have other processing following the EQ, such as saturation/distortion. Given the feature set, EQuality sounds like it'd be a handful to use, but actually it's not, and the manual is very helpful. This is a very powerful EQ in terms of sonic sculpting, and with up to 36dB cut and boost - plus the ability to shift the resonance of the shelves - you can easily create ear-splittingly loud boosts if you're not careful. Also potent are the notch filters on the four main bell bands and the dual high-pass filters. The latter work nicely together - you'd typically use one to remove rumble and the second to shape lower frequencies. Our only slight concern is that when using auto listen with the notch filters, the sharp Q combined with high gain can have you jumping out of your skin! "Given the feature set, EQuality sounds like it'd be a handful to use, but actually it's not." EQuality's flexibility means you don't have the point-and-shoot simplicity of a vintage EQ emulation. However, there's plenty to like, particularly in terms of practicality. For subtle enhancements and extreme curves alike, EQuality sounds great. We found the gain range control particularly helpful for accentuating existing settings or reigning in over-enthusiastic cuts and boosts. And the global frequency shift is ideal for zoning in on that elusive sweet spot or adjusting an EQ curve to suit a particular instrument. Also helpful are the eight memory locations, undo/redo and the option to directly manhandle the curve by dragging nodes. It may seem strange to get excited about yet another EQ plug-in, but EQuality packs so much in, you'll genuinely love using it. A really excellent first product from DMG Audio. 1. Drum kit: will a full kit mix, activating the auto listen then sweeping around the low frequencies with a bell-shaped EQ to find a nice boost frequency, then modifying the Q factor. Next, doing the same with a bell-shaped EQ in the higher frequencies. Then using the gain range to cut then boost all frequencies. Finally, using the shift feature to move all frequencies first up to 2x then down to half the original chosen frequencies. 2. Kick drum: Focusing just on the dry close-miked kick drum. Starting with the low frequencies and using a bell shape and auto listen sweep to find a good frequency. Settling on boosting the lower octave around 50Hz and tweaking the Q value. Then looking for upper mid frequency poke and settling around the 3kHz mark. Finally, setting one of the low cut filters to remove the excess created by the 50Hz boost - around the 30Hz mark. 3. Snare drum: Soloing the snare drum and looking for depth around the 150Hz mark - settling on 133Hz. Then dipping some of the boxiness (around 400Hz) and searching for top end crispness - settling on gentle shelf at 6.4kHz. Finally, looking for crack and boost a little at 1.7kHz. Then using the gain range to reduce the overall effect and bypassing to compare. All examples were created using EQuality's main Digital EQ mode.